Battlestar Galactica Viper MK VII Model Kit:Are you ready for a Cylon attack? Colonial fighter from the hit sci-fi TV show Battlestar Galactica. Viper MK VII includes an Aurora-style base and a resin pilot. The perfect choice for your Battlestar Galactica collection! Are you ready for a Cylon attack? 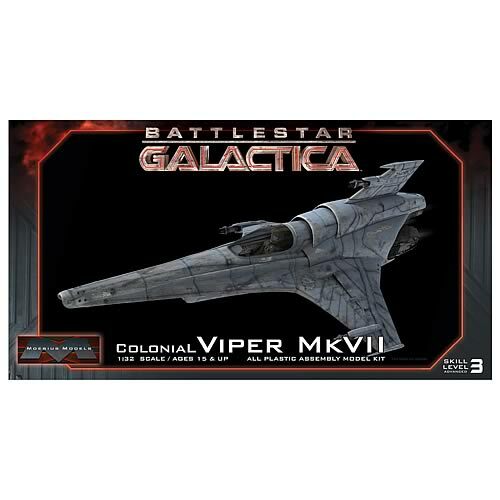 In the hit sci-fi TV show Battlestar Galactica, the Viper MK VII was the weapon of choice when a Cylon attack came. It was the successor to the more common MK II seen on Galactica. Here, in 1:32 matching scale with previous releases, this Viper MK VII Model Kit comes complete with an Aurora-style base and a resin pilot. Make this Colonial fighter a top choice for your Battlestar Galactica collection!